The marimba (South African xylophone), one of Africa’s oldest instruments, combines powerful rhythms and harmonies with lyrical melodies and is perfect as a feature performance or background sound. The Drum Cafe offers marimba performances, with the option of adding drums, song, dance, saxophone, steel drum or the instrument of your choice. Traditional African songs, original compositions and pop songs can be included in the repertoire. We can create special marimba pieces and custom-make marimba performances to match your event. We offer a wide range of top-quality South African based marimba groups, including a charming group of 11-13 year olds, Soweto Kidz Marimba Band. The Drum Cafe’s in-house marimba group, Basadi Le Meropa, is in great demand. Basadi Le Meropa is a group of young South African women, who tell the stories of their lives through marimba, song, drums, dance and the spoken word. Drumming has previously been a male-dominated cultural activity, but the Drum Cafe’s creation of Basadi Le Meropa in 2003 turned this stereotype upside down. Reprenting the strength, talent and optimism of African women, Basadi provide a refreshing performance filled with original composition and choreography, colourful costumes, exhilarating drumming, melodic marimbas, upbeat vocals and a wide variety of dances including stick-fighting choreography, Afro-contemporary dance, Pantsula and Township Jive. The show is unique in that it draws upon the individual experiences of the women, who are each performers in their own right. Basadi are also starting to branch out by playing other traditional instruments including the Mbira, Akadinda, Uhadi and Kudu Horn. Basadi Le Meropa also facilitate tailor-made interactive drumming sessions. 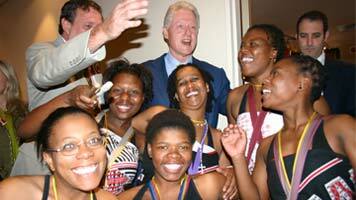 We can extend the Basadi to a group of eleven or more, for an even more potent all-woman experience. The ladies also come together with the white male virtuoso drummers of1st Project, in a sparkling fusion performance with elements of fusion drumming. Remember to read about the Drum Cafe’s wide array of performances, includingTraditional Music & Dance, Marimba, Gumboots, Dance, Jazz/World Music,Party Bands, DJs and MCs, Mzantsi Traditional Orchestra, Carnival and Circus Acts and Fusion/Crossover. We can combine marimba performances with a selection of our other performances.